If your four-legged friend is looking a little “fuzzy” around the edges, you may want to “paws” and take them in to Jill and Kim Hoover’s Fuzz Monsters Pet Grooming at 6401 Antelope Rd. in Citrus Heights. You can’t miss their colorful outside sign nor the bright chartreuse curtains in their windows. 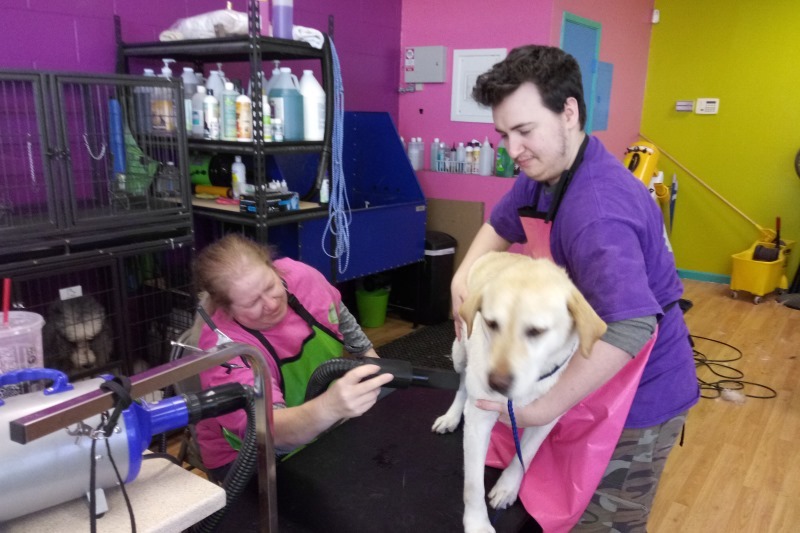 Hundreds of four-legged customers and their two-legged owners have walked through their front door for a wash and cut since their shop opened in August 2017, with customers coming from throughout the region to visit the shop. “We call our own dogs, ‘fuzz monsters,’ and we felt the name was distinctive enough to name our salon,” said owner Jill Hoover. Both now retired, the co-owners decided to put their love for animals, and their 35 years of grooming experience towards a full-service pet salon of their own. They’re now thinking of following their regular customers’ advice and trademarking their business name. Hoover, who lives in Rio Linda, earned a bachelor of arts degree in accounting, and worked at ADP. Fuzz Monsters welcomes all breeds of dogs and cats. The pair say their secret to a positive pet grooming experience is how they put their customers of all breeds at ease. The salon offers dog and cat owners a wide range of professional grooming services including, bathing, haircuts, toenail clipping and much more. During an interview with The Sentinel, Kim Hoover and her nephew David, who was assisting her, had their four hands busy keeping a frisky but friendly golden Labrador in line while getting a blow dry. What keeps her customers’ tails wagging and their owners happy? A cut that fits the breed and their pet’s personality, Hoover says. A cat bath package (2 hours for $50) includes a brush out (up to 15 mins) a bath, blow dry, toenails trimmed, ears cleaned, feet trimmed, a sanitary clip (if necessary), a spritz of cologne and a bow. A cat full groom service (3 hours for $75) adds a full body haircut or trim to the bath package. “Since many of our customers in the immediate area are senior citizens and on a fixed income, we try to keep our services affordable,” Hoover said. A 30-minute toenail trim for dogs and cats ranges between $5 and $15. There’s never been a problem at Fuzz Monsters with “Bring Your Kids to Work Day.” At least one, and sometimes two, of Hoover’s own dogs are her regular companions in the shop on most days. She’s the owner of a large, lovely Aussie doodle, named Maise, who was in the shop for a trim during The Sentinel’s interview. Between visits to their local groomer, pet owners can also take a few important steps to keep their beloved companions looking sharp. “We want to return your pet happier, healthier and more beautiful than ever,” Hoover said. Without proper cat and dog haircuts, she said pets also tend to shed more often. “Puppies are especially a handful, since their first visit to the groomer sets the tone for everything that follows. If they have a great experience, they’re much more relaxed when they return,” Hoover said. Puppies are ready for their first grooming encounter at about five to six months. Fuzz Monsters Pet Grooming is located at 6501 Antelope Rd., Suite 4, in Citrus Heights. Regular hours are Monday from 8 a.m. to 5 p.m., closed Tuesdays, Wednesday-Saturday from 8 a.m. to 5 p.m., and Sunday from 9 a.m. to 4 p.m. Additional information is available online at www.citrusheightspetgroomer.com.